This is a nice pocket park located in the heart of Georgetown's residential area. 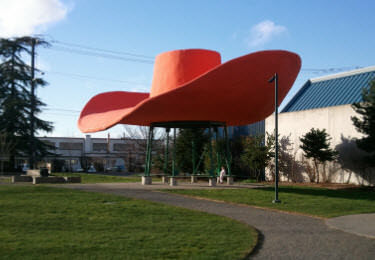 The park has some grassy areas for playing, a neighborhood p-patch, some play equipment for the kids, but most importantly - the restored giant Hat and Boots! Kids can jump on the toes of the boots and sit underneath the hat. It makes for some memorable photos.